Buono! – Gachinko de Ikou! 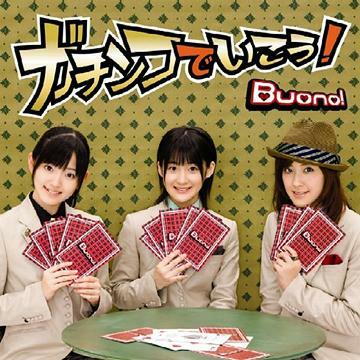 Buono’s 4th single doesn’t deviate at all from their well established sound. That’s not a bad thing since each single they’ve released has improved upon the formula their music is based on. Anyway, this gets stuck in your head fairly quickly. I like when songs get you hooked right away, no waiting for the good stuff to come along. I’m not opposed to long, epic-like tracks, it’s just that most times I’m in the mood for a quick fix. Which is exactly what this song does. It’s like a sugar rush without the horrible crash & burn effect afterwards. The video is pretty cool. I like the parts where they’re in the suits looking dead serious while playing various games. I’d like to know if those Buono! playing cards are for real, I wouldn’t mind paying for a deck or two. It certainly would make poker night interesting. It was also nice to see Miyabi with her hair down. I’m so used to seeing her with it in an up do, so it was kind of strange to see at first. But she looks pretty good with that reddish tint in her hair. Renai Rider has been my favorite Buono! single so far. Gachinko de Ikou! has officially taken its place.